Have things finally begun to crack with the CAGW narrative? Lets look at the recent data and compare it to Met office forecasts from just 4 months ago. What is really going on here is that their sophisticated climate models are being continuously tuned so as to “backcast” and agree with past temperature data. There has been no warming for ~15 years. As a result the parameters are now showing little AGW at all for the next 10 years. A scientist should ask the following question. 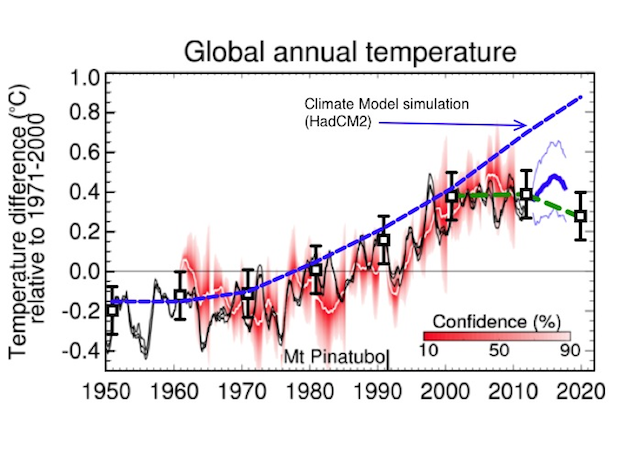 If predictions of GCM models from just 2 years ago have now been invalidated by the data, how can we now have any faith in new predictions made with the same models but with various fudge factors added ? Lets look at the new 10 year forecast and compare it to the previous forecast and data compatible with the new forecast. Fig 2: New Met Office 10 year forecast. In Blue the their model prediction from 2 years ago. In green real data till 2012, The last point in green is hypothetical , but in line with their new prediction – final blue shading. With fuel poverty rising, energy intensive industries closing, public debt rising, and renewable energy failing, is it perhaps not time to revisit the essentially “self-defeating” 2008 climate change act ? The Met Office seems to be getting desperate to pin something(anything) on rising CO2 levels. Global temperatures have not changed in 17 years, and UK temperatures have not changed in 72 years. The only thing left from model predictions is extreme weather, so I suspect we may hear more scare stories about storms, drought, floods, snow, heat-waves, Plagues of locusts, or ladybird infestations in the coming months. This entry was posted in AGW, Climate Change, Institiutions, UK Met Office and tagged CO2, Hadcrut4. Bookmark the permalink. From inspecting the Global Temperature figure carefully, it appears that your statement “Global temperatures have not changed in 17 years” is stretching the real data. Change 17 to 15 would be more scientifically acceptable in my opinion. That is bad enough for those who declare Global Warming as the source of all evil, and certainly puts the CO2 argument on very questionable footing. The CO2 content in the atmosphere has kept on rising in that same 15-year period. So where is the connection? I was basing the above statement on the graph shown below and the linear fit. If you use HADCRUT4 instead very little changes but the linear fit goes to +0.03C/decade. If your statement is based on the shown data of Hadcrut 3, then my 15-year comment fits perfectly. 180 months equals 15 years, doesn’t it? What am I missing here? Besides, as I wrote before, the data are more than sufficient to put the CO2 argument to shame. Isn’t that what we are after? PS – Are you aware that NASA is changing tune by invoking the Sun as main driver of Climate Change, in stead of the utterly weak argument based on CO2? Henri – You are absolutely correct. I can’t count ! thanks – I will change it. I think I picked 17 up from some other place ! Changes is water vapour in the upper atmosphere have a major influence on the outgoing longwave radiation (OLR). Line-by-line radiative code simulations show that a change of water vapour in a layer 300 to 400 mb (8 to 9 km altitude) has 30 times greater effect on the OLR than the same change in a layer at the surface. All climate models assume that water vapour in the upper atmosphere increases with warming. The NVAP team reported that total column water vapour has declined from 1998 values. And water vapour at 300 to 500 mb has declined significantly since 1995. I created an animation of world mapped water vapour in the 300 to 500 mb layer of monthly data images from 1988 to 1999. The years 2000 and 2001 are available but the images are in a different format so they are not included in the animation. You can see a significant drying of the upper atmosphere. That’s an amazing animation Ken. The monsoon oscillation over the Indian subcontinent fascinated me. Water vapor is the “missing link” in the “evolution” of climate science and I’m thrilled to see that the required data has been collected historically. I have no idea how to run this program. Is there Fortran software I need to download to run this? Can you provide a link? Can you explain how to use this to calculate the global average of the 1988 layer 1 data? You need a Fortran Compiler. I’ll see if I can get it running on MAC OS10 this weekend and let you know. I am using Windows 7 Ultimate with SP 1, on a PC with Intel 2.4 GHz processor, 2.0 GB RAM, 64-bit operating system. So I assume the command to run the Fortran compiler is g95. The program I want to run is nvap_all_glbave.f and the file I want to process is lpw1988.L1yravg_nvap.nat as shown in my previous comment. When I type g95 followed by the path to the nvap_all_glbave.f file and a path the the input file lpw1988.L1yravg_nvap.nat, it gives a bunch of errors. How do I tell the compiler what input file to run the fortran program on? Am I supposed to edit the Fortran program to point to the input file? I have compiled it and got it running. You wil also need to download the subroutines – http://eosweb.larc.nasa.gov/PRODOCS/nvap/read_software/nvap_ng_subroutines.f. Alternatively download the zip file for all the fortran code. CD to the directory you installed it in . with any luck it may work. (I now have another problem because bytes are inverted for Macs !) – so more work needed this end. Natural cycles are the reason for the slight cooling which will last for 30 years from 1998 to 2028. This autonomous “lapse rate” fully explains that “33 degrees of warming” without any need for any greenhouse effect. All should read this comment by, Geoff Wood, qualified in astrophysics. The following are excerpts ..
As Doug has said about a dozen times, gravity modifies the mean free path between collisions. That is ‘every’ upward, ‘every’ downward ‘every’ sideways, ‘every’, ‘every’ free molecular path between collisions is modified. Therefore it is impossible for the modified ‘collisions’ that result, not to impart the gravitational ‘information’ into the macroscopic development of the gravitational thermal profile. This is the ‘diffusion’ process. At this point, we have a reasonable depiction of the thermal profile of ANY atmosphere. FROM BASIC PHYSICS. Given a simple reason why any atmosphere tends towards this isentropic profile as depicted and described by entry level physics, why would anyone look for a more complicated reason to explain what we already know! That’s pretty interesting because my elementary planetary temperature model based on Stefan-Boltzmann and Beer-Lambert leaves a shortfall of +/-100K from predicted to observed temperatures on Venus. I’d love to see the math behind it and how well your model fits Mars and the atmospheric moons of Saturn. Can your theory accommodate climate variation? I don’t see how that could work. We want to compile the Fortran source code, not the NVap data file. The compiling worked to line 47 then got the error. I copied the subroutine “nvap_ng_subroutines.f” into the /bin directory. I don’t understand why the NASA NVap webste is providing the Fortran source code for the Global Average Fortran program. If the source code compiles correcting producing an EXE file, while don’t they just provide the compiled EXE file? I installed g95 on a windows 8 64bit machine. Note: Once installed you have to signoff and signin for the environment to be set up correctly. After which I then got the same compiler errors as you did. The fortran code is so old that it was probably develop on a DEC VAX or even a PDP 11. The default integer size may even have been Interger*2 or perhaps integer*4. This is exactly the same as ON THE mac. Therefore I assume again that the problem is to do with the default integer sizes ( 2 bytes or 4 bytes). Even if their code is obsolete, NASA should at least describe the binary format of their files ! I used your modified code to create an EXE file. It prompted for an input file, and I got the error message you got. I have exchanges a series of emails with Michelle, NASA Langley ASDC User Services. I had asked “Do you have the global average NVap water vapour values by layer for each month or year already calculated in a text file?” She replied “No.” I asked ” Can you recommend a Fortran compiler?” and gave my OS info. She replied “We highly suggest you ask your SA to assist you with this.” I assume SA means system administrator. I don’t have a SA! Today I sent Michelle and email detailing the compiling errors, provided the link to your modified fortran code, the the error from the executable. I requested “Please get Dave Randel or someone capable of writing Fortran code to correct the program, create an executable for the global average, and confirm that it actually calculates the global average from the file lpw1988.L1yravg_nvap.nat. I’ll let you know if this gets results. I have it all working. There are two problems. With regards to the 17 years, for RSS, the slope is flat since December 1996 or 16 years and 1 month. (goes to December) However there is no 95% significant warming for 23 years. At what point will the little boy shout to the assembled dignitaries ? Werner, what does this tell you about climate sensitivity? 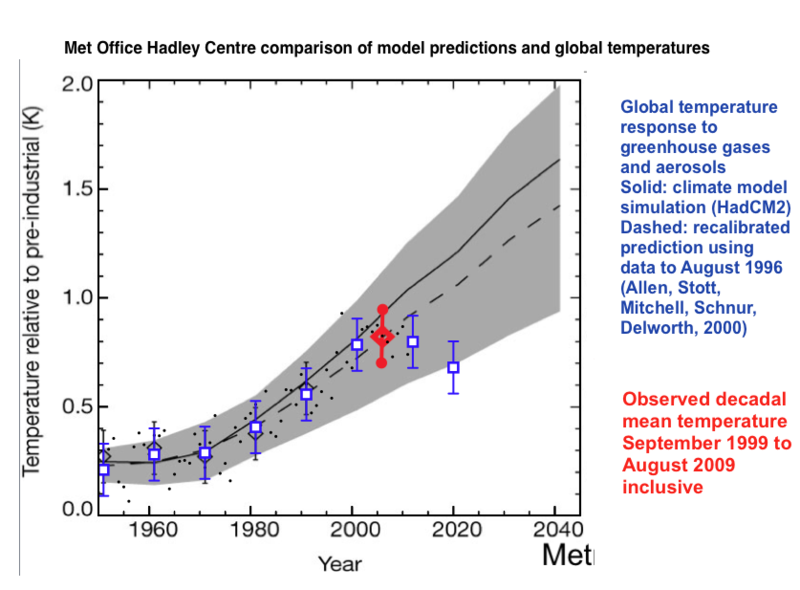 After 1997, I see no models with no-temperature-rise for more than 5 years. My previous email was incorrect because Chisty’s graph used a “7-year running average”. I loaded the annual data for all 37 models from CMIP5, scenario RCP 4.5 into excel. I calculated the best fit slopes over every 15-year interval ending from 2011 to 2050. There was only one model that showed a negative slope at any 15-year interval. It shows two separate periods of negative slopes, 9 overlapping periods. No model shows a negative slope for the 15-year period ending 2012. I calculate a 0.6% chance (9/(37X40)) of a 15-year period of no warming if the climate model assumptions are correct. When I studied your latest temperature trends and in the same graphs the CO2 increasing behavior, it shows clearly that the correlation between the two data sets is almost insignificant or even negative. The exact numbers will bear that out, I have not done that yet, and frankly, it will not tell us anything more than what can be observed. This is not just a “statistical fluctuation”. It puts a definitive hole in the argument of CO2 being the cause of global warming. I sent you an email with this same comment, and an additional question which I will not repeat here, since it is of only ancillary interest. Your data set is of great value! There is a physics case that an increase in CO2 reduces slightly the amount of radiation to space from the atmosphere. It does not directly effect the radiation emitted from the surface. So everything depends on what happens to the atmosphere, and of course solar radiation. If nothing else apart from CO2 changed in the atmosphere then the surface would warm by ~1K by 2100. This increase could either be offset or amplified by knock on effects in water vapor content. Small changes in Solar activity gets amplified somehow. What has NASA said recently about solar influence on climate ? NASA Issued a report by Dr Tony Phillips, “The Effect of Solar Variability on Earth’s Climate”, which is an extensive amount of information regarding the Sun’s influence on the climate, rather than CO2. One comment by Dr Ball was that he considered this to be “a turn by NASA away from Dr Hansen” who is/was the big pusher and defender of the CO2 myth. Apparently, from the highest level up at NASA, Hansen was not to be criticised, and therefore he has lasted so long (30 years?) without being challenged, and of course neither did the press. The NASA report is available from the National Academies Press, either by buying it or downloading it free. It is rather extensive and should be carefully assessed as to what is being claimed. All the hemispheric and global temperature data from the CRU has gone missing. It has been replaced with a page showing how wonderful Phil Jones is. By the way, December is out on a different site of theirs. 0.269 on Hadcrut4 and 0.233 on Hadcrut3. 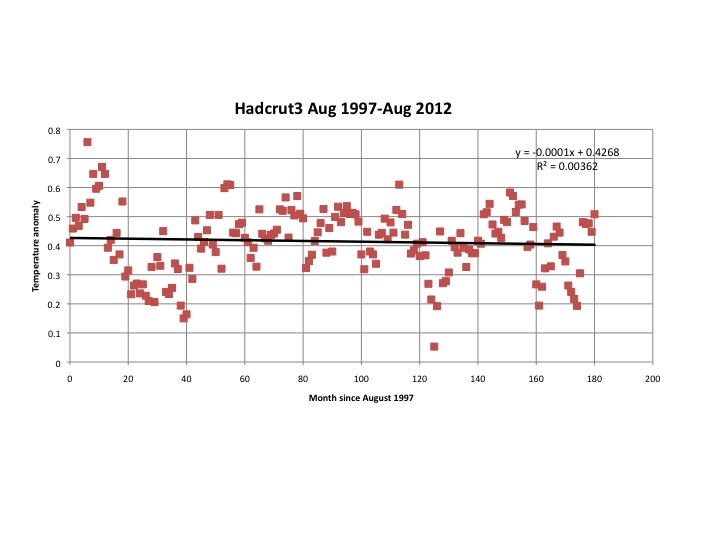 With Hadcrut4, the anomaly for 2012 is 0.436. This would rank 10th. With Hadcrut3, the anomaly for 2012 is 0.403. This would rank 10th. Thanks Werner. The problem was my computer loaded the temperature page from cache, but it was changed on the CRU server. The page I saw still had links to the .txt files, which no longer exist, so I got the CRU home page for all the txt files. Forcing a reload by holding Shift, click, I got a new Temperature page with .dat files. Clive has helped me to calculate the global average precipitable water vapour by layer from the gridded data set. The fortran source code provided by NASA did not work. Clive modified the program to work on a Mac. The NASA help told me they do not have the global average values. The global annual average precipitable water vapour by atmospheric layer is shown in the follow graph. A paper titled “Weather and Climate Analyses Using Improved Global Water Vapor Observations” was accepted 28 June 2012 for GRL. Note that the NVAP-M average is 0.84 mm greater than the Heritage data. The average of the Fortran calculated values are 7.39 mm greater than the Heritage values reported in the paper. Something is seriously wrong with the Fortran global average program. The NVAP webpage says “NVAP-M will be transferred to the NASA Langley Atmospheric Science Data Center (ASDC) in fall 2012.” But it is not there yet. Ken, when I drag friendsofscience.org onto my bookmark toolbar, why don’t I get an icon? This is a fascinating thread and even after seven months of following the climate debate on the web for seven months, I’ve learned a lot from just this page we’re on now. I like to think that my opinions are flexible but oh boy have they been flexed today! oldfossil says, “Ken, when I drag friendsofscience.org onto my bookmark toolbar, why don’t I get an icon?” I’ll try to set that up!